Glendale, Arizona was my home town. My school classmates there were lifelong friends. But my comfortable life in Arizona was abruptly interrupted in 1958, just prior to my senior year in high school, when my parent’s divorce gave my mother reason to move to Provo. Glendale now seemed to be on the other side of the world from Provo. I'll never forget what I was wearing that first day. Maybe because it was white cotton, completely out of sync for autumn in Utah, or maybe this vivid memory is just a female thing. It didn’t take long for me to realize that my desert lifestyle wardrobe needed a makeover. I quickly discovered seasonal fashions, and learned how layering was a stylish way to stay warm. But, fashion is not why I'm writing this story. My real story begins with the greeting I received as I entered that marvelous building. Standing alone within a few steps of those grand doors was a girl named Lorraine. She saw my confidence crumbling and raced up to me. “Are you new?” she asked urgently. I nodded, not sure if I was condemning myself or had just passed a test. Within a very short time we found two other girls with the same lonely demeanor: Lynda and Charlene. Lynda moved from Idaho to Provo with her mother and other siblings, following the death of her father. Though Charlene had attended BYH her sophomore year, she’d moved back home to Oregon. Then her family chose to return to Provo during her senior year. Lorraine’s hometown was Elsinore, Utah, but when her parents moved to La Sal, Utah, she chose to stay with friends in Provo. Like in a chess game, all of the pieces came together and fell into their special place. Attending a new high school in one’s senior year could cripple most kids. In our case, however, with the companionship of other peers in need of belonging, we grew inseparable. We soon called ourselves the Four Musketeers, the Fearless Foursome, and a half-dozen other titles which have long slipped my mind. How did we do that year? 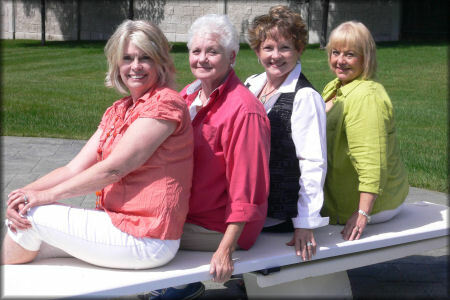 Well, check out the picture of the five senior officers on the home page of the Class of ’59. 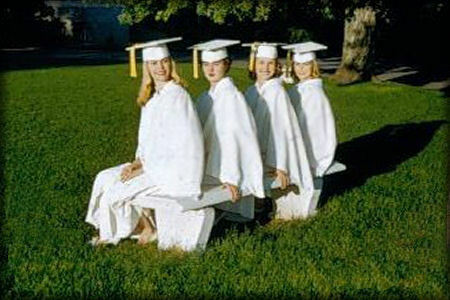 Two of those students – are Lynda and Lorraine. Left to right, front: Lynda Goodman & Lorraine Fullmer. Rear: Micky McDonald, Cliff Pierpont & Gary Rose. Check our alumni profiles on this BYH website, to see that Charlene and I also managed to do okay, too. I must quickly add here, that though we were the outsiders, our other classmates were always supportive and friendly. It is not too late to thank them for that. We learned from them and enjoyed their acquaintance as they enriched our senior year! There are many stories. Charlene, as the manager of the Hi Steppers, says – “One of my most fun memories was a trip to Bicknell with our P.E. teacher and Hi Steppers’ director, Juanita Rogers." Lorraine’s world changed for her when Juanita Rogers pulled her aside and ordered her to try out for the Hi Steppers. 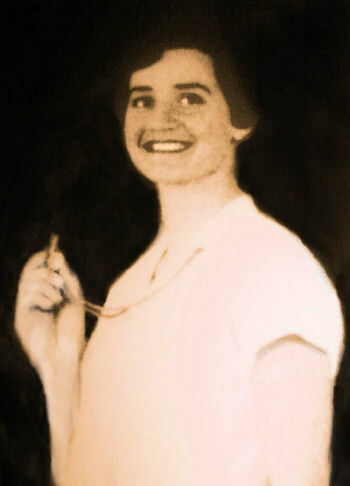 Not only was Lorraine crowned Seminary Sweetheart, she also discovered her creative skills as an artist. Today she’s an accomplished and recognized artist and seamstress. Lynda seems to have the best memory of the four of us -- no wonder she was elected class secretary! “That election meant so much to me,” Lynda says. “I helped plan and execute our traveling assembly, decorated for dances, prepared for the graduation program, helped to bring it all together, directed the class during our recitation of 'Countdown to Destiny' at graduation, and I sang in a sextet at graduation. For 50 years, Lorraine and I have entertained each other over one particular colorful episode, which any other evolved coeds would forever hide in a secret vault. But, since we’re out of the long reach of our parents and the principal’s office -- our story can now be told. It began when we attended a box dinner and dance in the Men's Gym upstairs in the Training School building. We female students filled decorated boxes with morsels of food, and the guys were supposed to bid on the boxes. Neither Lorraine’s box, nor mine, sold. Now, that little event, right there, might have destroyed lesser women, but not us! We grabbed our boxes, and skipped out of the event. We came up with a scheme to go find our friend Max, a Canadian, and also a BYH student who, like us, was new that year. Max was also an outstanding boxer. We found Max at his apartment and proceeded to entice him into enjoying our meals with us. Then we talked him into playing strip-poker with us. Don’t gasp, ye of little faith. Ultimately, we were BY High students! Would we have brought shame upon our soon to be Alma Mater? Never! Though the game was ruckus filled, we removed nothing of significance. Our boundaries, we are proud to report, were guarded by our budding spiritual DNA. Only a top button or two got undone, after shoes and jewelry were removed. Aw yes, we were daring, but also commendable cowards! And, I might add, considering what could have been, we were a good influence on Max. Well, sort of. Our senior year was marvelous, an invaluable preparation for our lives, and it left us well rooted in an institution touting the highest quality teachers and fellow students. All of us went on to study at BYU. Lorraine and I, to our surprise, each landed a position in the Cougarettes drill team, thanks to the training and confidence Juanita Rogers instilled in us through the Hi Steppers. I had always planned to attend BYU, but before arriving in Provo I had never heard of the little school named BY High. This unknown institution soon became home not only for me, but for many other displaced students over the years. 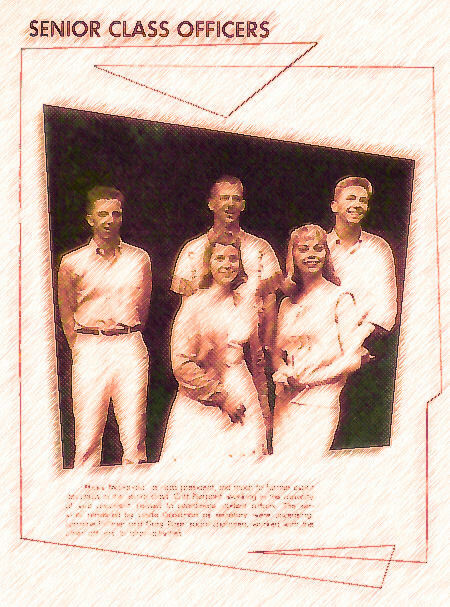 We four came in 1958 with common pain, all new in town, having been torn from that which was familiar. By the following spring we were proud to be members of the Class of '59. Today, we Four Musketeers remain supportive of each other and stay in touch. With families and active goals our lives are full and continue to be productive, but we are friends forever. In the perspective now given to us by our 50th year graduation anniversary, that’s amazing. Four young women, at risk, nurtured each other, and in turn were empowered by an influential institution. One year, out of a lifetime, made a lifetime of difference for us. 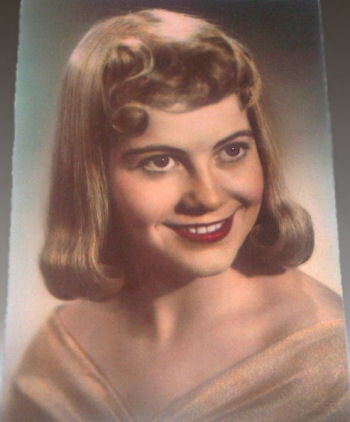 The author, Linda Tenney Turley-Hansen '59, is a mother of four and grandmother of 11. Linda is a retired Phoenix, Arizona primetime TV news anchor, and is currently a locally syndicated newspaper columnist. 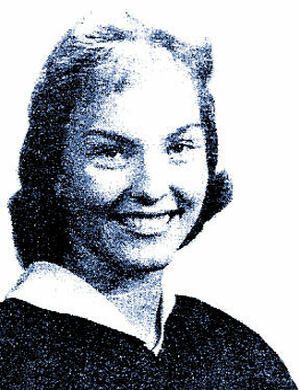 Lorraine Day said her life changed the minute she entered the "hallowed halls" of Brigham Young High School in 1958. Day was a senior and a transfer student to the school — located at the Academy Building in Provo. She desired better educational opportunities and a year later, she was a proud graduate of BY High. Her father also attended school in the Academy Building, cleaning blackboards to pay his way through what was then called the “lower campus” of Brigham Young University. Provo’s Academy Building has had different names, faced much resistance and undergone extensive reconstruction; yet, as this month marks 125 years since its doors first opened, the building continues to serve as “a center for public education and learning in the city,” Dina Blaes wrote in an article featured in Utah Preservation magazine in 2000. After six years of construction, the instructors first welcomed 1,000 students to Brigham Young Academy on Jan. 4, 1892, making it one of the largest schools in the Rocky Mountains, according to a brief history provided on the Provo City Library website at provolibrary.com/academy-history. Despite the institution’s predominantly high school-aged demographic, the name changed to Brigham Young University in 1903. Brigham Young High School also formed at this time and was also at the Academy Building. School life in the Academy Building included a “well-rounded, well thought-out curriculum,” Day said. Day enrolled in his art class and enjoyed it so much she ended up attending BYU on an art scholarship. “But I still can’t make a poster,” she said with a laugh. 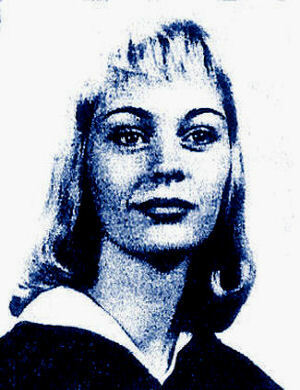 Day was also involved in a group called “Hi-Steppers,” which was the precursor to BYU’s Cougarettes. “The deepest friendships and the deepest desires I ever learned I learned at BY High School,” Day said. Both Brigham Young High School and BYU’s “Lower Campus” came to a close in 1968 when the University stopped using the building, according to the Provo City Library website. With its school days over, the Academy Building entered an extended phase of uncertainty. It was sold in 1975 in hopes of being redeveloped; however, it sat unused until Provo City bought it in 1994 with the plan of tearing it down, despite the many efforts of residents to keep it maintained, according to "Miracle at Academy Square," by retired BYU professor L. Douglas Smoot. As bulldozers prepared to demolish what was viewed to be a structurally unsound building, Smoot, great-grandson of early financial supporter Abraham O. Smoot, led a preservation effort with the Brigham Young Academy Foundation members and city council members beginning in 1995 that he described in his book as the "Miracle at Academy Square." Through fundraising, advertising and petitioning, residents were rewarded for their diligence and the Academy Building received a vote of approval in 1997 to become the Provo City Library. The groundbreaking ceremony occurred two years later on July 9, 1999. The ceremony “demonstrated all parties’ commitment to put aside differences and work together,” Blaes wrote. Much work remained to be done if the Academy Building was to transform into a city library. A main goal in the reconstruction was to “maintain the veracity of the facility,” Nelson said. They did extensive research and strived for historical accuracy. Bricks from the initial time period were used, and the roof shingles were purchased from the manufacturer that produced the originals for the building in the 1890s. Although the building’s interior was completely redone, they worked hard to salvage some things — including the ballroom, according to Nelson. He explained that at various times the ballroom had served as a study hall, a library and even a place for student housing. “Traditionally and historically it was used in a very multipurposed sort of way, which is today how we use the room,” he said. The Academy Building was rededicated as the Provo City Library on Sept. 8, 2001. Nelson said the location has allowed the library to become a gathering place for people in Provo. “(The building) has such an incredible connection with the community that even after being open now for 15 years, I still have a lot of people coming back to see it for the first time,” Nelson said. For Day, seeing the Academy Building brings her joy. “(The building) was the beginning of my education, the beginning of knowing who I was and what I wanted," she said. "When I see it now, my heart skips." Lottie Peterson Johnson is an intern for the Deseret News. 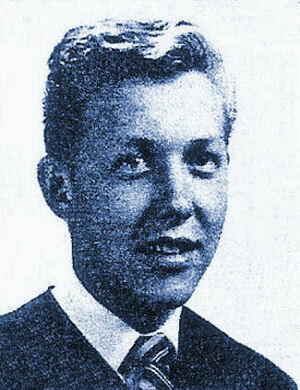 Class of 1959. 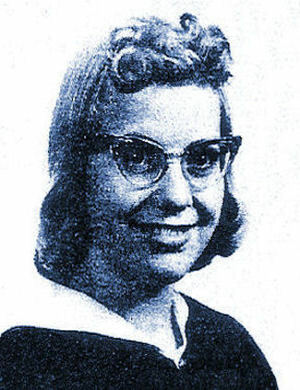 Lorraine Fullmer. Senior Class Social Chair. Seminary Sweetheart Queen, Hi-Steppers, Senior Certificate, Special Art Award, Kiwanis Scholarship, BYU Scholarship. 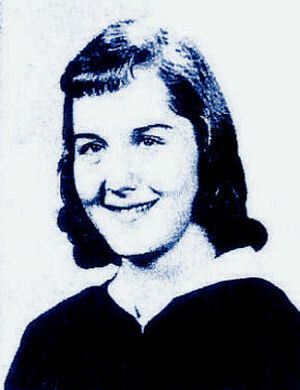 Lorraine Fullmer married Andrew J. Day III. My parents moved from Elsinore, Utah in my Junior year at South Sevier High School in Monroe, Utah. They moved to LaSal, Utah, to manage the Redd Ranches store, which meant that I would have to take a school bus 40 miles each way to high school in Blanding. I decided that I didn't want to do that so I arranged to go to Provo and live with family friends. The Redd family introduced me to BYH because their children went there. I wanted to see if I would be interested in going to BYU, so I thought a year away from the sage brush and bus ride would be of help. But I felt like a lost soul that first day as I walked into those wonderful old halls. Everybody seemed to know what they were doing, where they were going and they all knew each other. There was one cute girl standing in the hall who wasn't talking to anyone and looked as out of place as I was. I glommed onto her and never let go. We became the best of friends and were so much alike. Her name was Linda Tenney and the bond grows stronger every year. I loved BY High. I learned how to study and found my teachers excellent and the classes challenging. I don't think I could have made it through my time at BYU without the discipline I had at BYH. One of the best experiences of the whole year was the day I met Juanita Rogers. I was leaving campus after school one beautiful fall day and she met me on the path. She grabbed me and said she wanted me in the gym in 10 minutes to try out for Hi-Steppers. I told her, "No way am I going to make Hi-Steppers, and thank you but no." She was a strong woman and I went. She was wonderful and helped me gain confidence in a school in which I was not comfortable. I went on to BYU and made it into the Cougarettes, which was such a blessing. I was also elected a Social Chair along with Gary Rose. One of my jobs was to make posters to announce dances and coming events. One day after looking at one of my posters in the hall, Mr. Hellberg caught me in the hall and said, "If you want to keep your job as Social Chairman, you will have to learn how to do a poster." I guess it was awful. I met with him in the art room and we worked together on posters. I never did do a good poster (still can't) but I enrolled in his art class and found a niche in my life. I won a scholarship to BYU in art and it has been a love of mine ever since. I have won ribbons, sold to friends and in galleries. I had another teacher at BYH who was a puzzle to me: Mrs. Caine. She scared me to death when she looked at me or when I had to do an assignment in her history class. I soon found out, after almost failing a few assignments, that the cover of each assignment was as important as the content. I had to be real creative to please her. I never saw her smile but she was a very good teacher and made boring subjects come alive. Another wonderful event was that I was elected Seminary Sweetheart and was asked to give a talk at Seminary graduation. My life was good at BYH. I married Andrew "Drew" Day after my first year at BYU. He was a returned missionary from Brazil and finished school shortly after I married him, so my stay at BYU was short. We moved to LaCanada, California where we began our family of five children. We now have 13 grandchildren and 1 great grandson. In 1980 we moved to Utah and have lived in Sandy since, except for three years we spent in Brazil as Mission President for the Brazil North Mission from 1987 to 1990. That was one of the highlights of my life. The hardest thing I ever did was to learn Portuguese. My life has been good. We have traveled to so many wonderful places. We have three homes: a mountain cabin in Gunnison, Colorado; a beach condo in San Clemente, California; and our wonderful home in Sandy. It keeps us busy just remembering where we are when we wake up in the morning. I don't think I am complaining. My life is full of wonderful family -- church -- art -- quilting -- cooking -- friends -- book club -- traveling -- exercising -- I wouldn't trade any of it. I feel like a blessed woman. So much of it started at BYH.